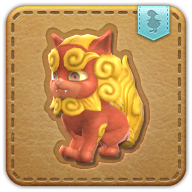 Summon your komainu minion. Part lion, part dog, all lion-dog. Believed to ward the places from intruders with evil intent, statues of these mythical lion-dog creatures are oft erected at the gates of sacred locations such as shrines. When paired with another, they will always face forward.